This week Indianapolis plays host to national and international music events presented by both the Percussive Arts Society and Music For All's Bands of America. 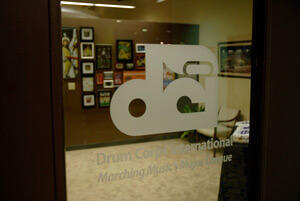 Drum Corps International invites all marching music fans in town to stop in during an open house at our corporate headquarters (110 W. Washington St., Suite C; one level down from Weber Grill Restaurant next to Rhythm! Discovery Center) on Friday, Nov. 13 anytime between 11 a.m. and 1 p.m. ET. Take a guided tour of our new facility and chat with staff members about next season. We'll have our brand new '09 World Championship DVDs in stock if you'd like them in your hands before anyone else, and don't leave before taking your photo by the legendary DCI World Championships trophy! View the location of DCI's office on Google Maps.